It’s made with 1 skein of FibraNatura Cobblestone yarn in a pretty multi-color that will coordinate with many things in my wardrobe! I think this yarn is discontinued, but that’s okay with me. I still like the colors in it and I love how the colors change within one of the 2 plies. The other ply stays the same color (in this case it’s pink, which I love! ), which tones down the color changing ply so it’s not too “in your face”! This yarn is 100% superwash merino wool and has 153 yards in the 50 gram skein. It’s a sport weight yarn, which is about the weight I wanted to use for this skinny scarf. 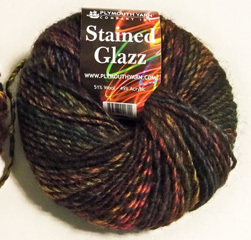 I stumbled upon this skein of yarn at one of my local thrift stores last year for 99 cents! That’s a great price for a skinny scarf (or any scarf/project), as far as I’m concerned! Because there’s so much going on with the color changes in this yarn, I chose to use a simple stitch pattern to show off the colors of the yarn better. This scarf turned out exactly how I had imagined it and I think it’ll work out great in my wardrobe! What about you? What do you like to make with one skein of yarn? Do you like to make hats, scarves or something else? I’m not much of a hat person because of my curly hair. If I put a hat on, I’d better leave it on for the rest of the day, or else hide my flattened out “hat hair” at home (it’s really bad)! I hope you’re enjoying the spring (or fall, if you live “down under”) and are taking time to enjoy the relaxing, creative benefits of crochet! 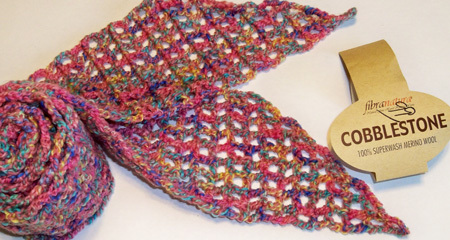 This entry was posted in Designing, Yarn review and tagged Designing, yarn. Bookmark the permalink. I love making hats with single skeins. Scarves/cowls too – I find they’re great seasonal transition pieces when it’s too warm for sweaters but I want a little something extra to dress up my plain shirts and turtlenecks. I’m currently participating in a Spring Cleaning KAL (http://www.ravelry.com/discuss/chain-344-podcast/3386035/) which runs until June 19, 2016; it’s all about using stash and encouraging me to look at stash before adding to it. I agree wholeheartedly about scarves and cowls dressing up plain shirts and turtlenecks! And they don’t take long to crochet, either! Thanks for the link to the Ravelry group. I’m going to check it out. Susan, I get terrible hat hair too so I try to avoid hats unless I really need one to keep warm. Scarves are great for 1 skein projects. I will also combine a single skein of yarn with another yarn so that I have enough for a project. I got some of that Cobblestone yarn that you used in your first scarf on close out. I combined it with a coordinating solid yarn to make a poncho that I love. That is a great idea to combine one skein with another skein to make a larger project! Thanks so much for sharing this tip!